A decade on from suggesting light can be dramatically slowed - or even stopped - by new materials, Ortwin Hess reviews the progress and applications. The top speed of light is very fast: 299,792,458 metres per second. As it passes through transparent materials, like water or glass, it slows slightly. 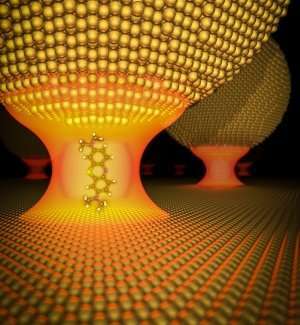 However, scientists think that by slowing light to a much greater degree – making it millions of times slower – they could use it in whole new ways, such as to transmit and store information or to interrogate and control single molecules. In 2007, Professor Ortwin Hess, now Leverhulme Chair in Metamaterials in the Department of Physics at Imperial, published a theoretical paper with his student Kosmas Tsakmakidis and their collaborator Allan Boardman. They suggested that by using metamaterials – those designed to have properties not found in nature – they could slow light down, and even trap it. Now, 10 years on, they have published a review in Science of how that idea has led to new theories, experiments and applications. We talked to Professor Hess about how slow light forms a 'trapped rainbow', and how the potential applications now extend to magnetic storage, lasers, biological imaging and even earthquake shields. What is the 'trapped rainbow' and how does it work? The process of creating a trapped rainbow relies on metamaterials or nanoplasmonic structures endowed with special negative properties, surrounded by 'normal' materials. As light moves through the special material, it is pushed backwards in small steps where the two materials meet. It's like walking up a steep, snowy slope – every step you take up, you slide back down a little way, slowing down your progress. The difference in the material is that each time the light is pushed back it slows more and more. Eventually, as the white light slows, its different components – all the colours of the spectrum – stop at different points, creating a 'trapped rainbow'. Since the original idea, a lot of groups have tested various ways of making this work. Some of the materials have changed, but the idea remains the same, and has led to some interesting potential applications. In your original paper you suggested it could be used for data transfer. How would that work? As light travels very fast, and is broad band – meaning it covers a wide part of the spectrum – it can be a very efficient method of data transfer. This is how fibre-optic internet connections work, for example. However, in order to access data from a fast-moving stream, we need to slow it down. This is like a car exiting a motorway – it has to slow down as it approaches the junction. This process is called buffering. Currently, to slow light signals down, we have to convert them to electrical pulses, and then reconvert them to light once they have been accessed, to get back the original data. By slowing light itself down, rather than converting it, this process would be much more efficient. We could also use light much more widely for transmitting data across a broad spectrum. How are you using slow and stopped light in your research? One way slow light is useful is in increasing interactions between light and matter. Often, because light travels so fast, it doesn't interact much with matter. By slowing it down, we can make these interactions stronger, manipulating matter in new ways. For example, we achieved this recently in collaboration with the University of Cambridge. We held a molecule and a photon – a particle of light – in a tiny trap, so that their properties mixed. My team are also interested in stopped-light lasers. Lasers are amplified sources of light at particular wavelengths, which can be focused into a beam and transmitted over long distances without losing focus, like a traditional torch does. Lasers are created by pumping energy into electronic states, for example molecules, causing them to emit photons when they relax back to lower energies. These photons are then bounced around in a confined space, stimulating more active molecules to synchronously release photons, until a high-energy beam is created. Stopping light would allow more confined interactions between active molecules and photons, potentially allowing lasers to be formed more easily and more locally, without bouncing around a space. Since you proposed the idea, people have suggested many innovative applications. Can you tell us about some of these? Theoretically, the interesting applications for us are to do with investigating the quantum behaviour of matter and packets of stopped or ultraslow light. One interesting practical example is guiding light to a small spot in order to create very local heating on microscopic scales. A major application of this is enhancing magnetic storage – the kind that runs your computer hard drive. Magnetic storage requires the formation of tiny magnetic fields, but at the moment these fields are as small as they can get, limiting how small we can make the storage devices. By slowing light down in an extremely confined area, we can increase its intensity. This causes heating on a very small scale, creating miniature magnetic fields that mean we could increase the storage density or reduce the size of devices. Another potential application is in biomedical imaging. To image some biological materials, the intensity of the laser light has to be increased, but this can destroy the sample. By slowing the light, we can allow it to interact for longer with the sample without damaging it. 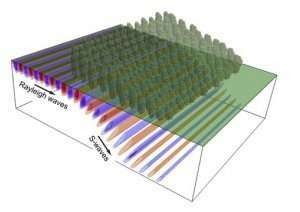 The 'trapped-rainbow' concept of slowing waves has not just been applied to light though. It works also for electrons. And one really innovative idea, actually being tested by a team including Imperial researchers, is slowing seismic waves. By cutting large-scale metamaterial-style structures into the ground, or even into trees, they have shown it is possible to redirect seismic waves into the ground, protecting structures from earthquakes. 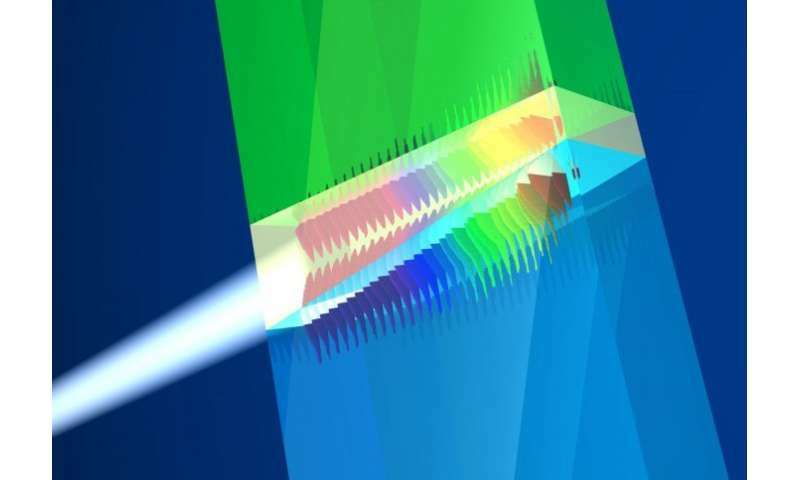 "Stopping light would allow more confined interactions between active molecules and photons, potentially allowing lasers to be formed more easily and more locally, without bouncing around a space." - So we can wildly speculate... could you store enough light in a battery to power a handheld laser? No conversion would mean great efficiency. "Phaser power packs, used in some type 2 phasers and phaser rifles, were one of the most common types. In the 23rd century, members ..."
Perhaps even a real 'photon' torpedo. I suspect the storage of the light is in the electric fields of the electrons of the materials they used. ie Polaritons. Not sure of the numbers, but there must be a limit to this before chemical breakdown of those materials occur. I do recall about a decade ago someone was making LIGHT BRICKS, that could trap and store light, then release it slowly. Not sure what happened to that. Sounded promising, perhaps for night time "sky lighting" in a house. The SF story "Light of Other Days" by Bob Shaw introduced the concept of 'slow glass' where light can take years to traverse a window pane. The idea that light can be slowed arbitrarily is very interesting and would have many commercial applications. When I think of 'slow light' I wonder about an odd relativistic effect that photons have. In normal light, photons can't change, decay or do anything other than travel, until they hit something that interacts with them. This is because from the photons point of view, it is still experiencing the same 'now' from the moment it get created by being emitted, until its path is terminated by interacting with something else. No matter how much time for the rest of the universe has passed, the same photon that was emitted by the first light of the universe, has had no time affect it until it gets picked up by one of our telescopes. But now add in the possibility of 'slow light' now time can effect that photon...could we discover the 'half life' of the photon? Perhaps in 'slow light' it can evolve? Is there % change a 'slow photon' can be effected by quantum random event that 'fast light' can't be bothered with?